Guardian angel Enael can’t seem to keep her human Wards in check. They’re the ones who choose their paths before reincarnating—she’s just there to help make sure they stay on track. But it’s not as easy as it might look. When she meets and falls in love with charismatic Kaspen, a fellow Guardian, Enael’s feelings about Heaven, Hell, demons, and the life she’s known are turned upside down. Worse, angel-turned-demon Yasva, Kaspen’s former love, still holds him in her clutches. Even as Yasva works toward obtaining complete control of Earth, she taunts and haunts Kaspen’s and Enael’s lives. Now Enael is forced to face her past (which is centuries long and bursting with secrets), her present (which is terribly unfulfilling and full of questions), and her future (which becomes more uncertain as time passes). 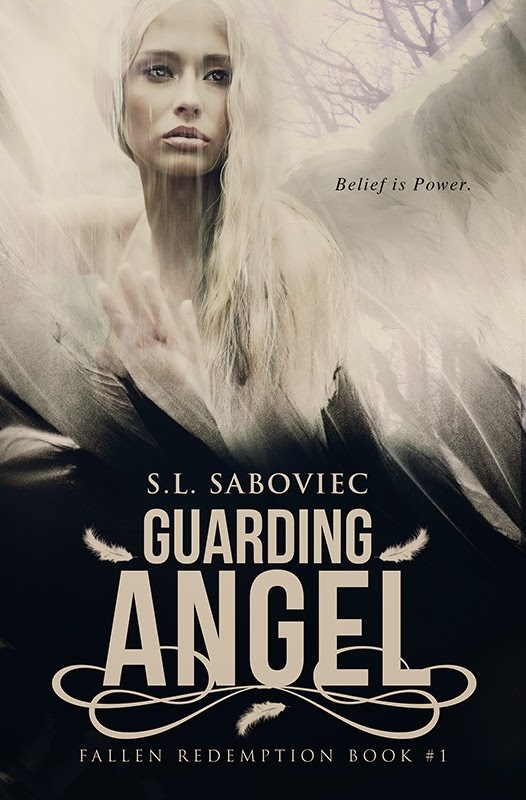 Armed with a newfound love and fear of losing it all, she must figure out how to save the world—-and the angel she loves. Which side will win? Who will Kaspen choose? Will Heaven and Earth continue to exist, or will everything go to Hell? One of the central ideas in the world of Guarding Angel is reincarnation. The main character, a guardian angel named Enael, is responsible for guiding the spiritual growth of her Wards during one of their lives. One woman is only on her second life, while another man is on his sixty-fifth. Their common characteristic is having lived multiple lives and the desire to experience certain things on their return to Earth. Many Westerners (you, perhaps?) don’t believe in reincarnation because the predominant religion here is Christianity. To believe in being born more than once is heresy because it is contrary to the purpose of this life. However, evidence suggests that past lives are not only a possibility, but they shape who we are, what we fear, and even physical traits in our current lives. My favorite type of past life stories are children who recall living before. From the little girl who can describe the moment of her previous death to the little boy who has an uncanny knowledge of details relating to his previous profession, I love hearing them. Children’s Past Lives: How PastLife Memories Affect Your Child by Carol Bowman is a fascinating read if you want to delve in-depth into what two- to five-year-old children routinely remember from previous lives. If you want some quick snippets of stories, the blog article 10Amazing Things Kids Have Said About Past Lives is sure to give you goosebumps. So How Did You Die? One interesting belief about reincarnation is that a violent, sudden, and unhappy death may cause birthmarks in future lives. As the Wikipedia article onbirthmarks states, “the exact cause of birthmarks is not known.” Not definitive proof, of course, but speculation is interesting. Mikhail Gorbachev’s port-wine stain on the top of his head is one of the most famous birthmarks in the world. Is it just me or is it reminiscent of two hatchet marks? Ouch. I have one birthmark. It’s a one-inch oblong mark with jagged edges on my inner thigh. I’ve contemplated how I could have died from a wound like that. Since it’s over my femoral artery, I think that perhaps a few lives ago, I died of an arrow or a bullet wound in the leg. Was I a Native American, running from an enemy? Or a Civil War veteran who took a shrapnel hit and bled out on a battle field? At this point, I’d rather not know, but it’s interesting to speculate. Another unpleasant aspect of having lived—and died—before is that our souls remember what our conscious minds don’t. Part of why reincarnation is on my mind (besides the release of my book!) is that I recently had a past life reading. I asked the psychic a few general questions, one of which was, “I have an irrational fear of dying a certain way. Why is that?” Don’t get me wrong—I believe in psychic phenomena and past lives, but I’m also well aware of leading questions, so I made this one as general as possible. The answer was, paraphrased: I had lived two lives where I had drowned. The first was when I lived on an island. A tidal wave crashed over where I lived, and many people died. The second was on a boat. The boat broke apart during a storm and I drowned in the ocean. When I asked the question, I wasn’t expecting that response. Instead, I was thinking about how I can’t handle horror movies in which people get eviscerated (even typing the word makes me shudder). That started when I was in seventh grade and read Jurassic Park. The scene where those spitting dinosaurs kill Dennis Nedry still haunts me. But then I remembered: A few years ago, I developed an irrational fear of water deeper than my shoulders. When I told my husband about the past life reading, he said, “Yeah, I remember. We were at a hotel, and you were in the deep end, and you said, ‘I can’t stand to be in here. I have to get out.’” And when we went to Jamaica a year ago, I was ok being in the ocean because it was clear and no more than shoulder-deep. But when I’d been to Puerto Rico years before and the water was cloudy, I was terribly afraid. I can’t tell you if I drowned in a past life. I can tell you that the fear came upon me in recent years—growing up, I loved swimming pools. You couldn’t keep me out of them. But one of the aspects of phobias caused by past lives is that they may come upon a person when they reach the age at which they died. So Have You Lived Before? Whatever you believe, the idea of living multiple times is a fascinating one. It’s interesting to consider that we could be leaving a legacy throughout history more than just creating offspring by living and dying multiple times. What about you? Got any interesting birthmarks you’d like to hazard a guess about? Any irrational fears that cropped up recently? Have you talked to a child lately that knows way too much about 1800’s London? Samantha grew up in a small town in Iowa but now lives in the suburbs of Toronto with her Canadian husband and expatriate cat. In her spare time, she reads, writes, and thinks about reading and writing—along with playing the occasional video game or eight.